On the lovely Wednesday morning everyone woke up in extreme anticipation of the excitement coming. Both Boys and Girls campers woke up a little bit early so that they could be ready for the Doc Wheels Fun Run. Both camps met at Graceland for some warm up stretches (including the liver twists of course.) And just like that they were off!! There were three different options for the campers to take. The first was the group for the fast runner, this path took them all through Girls and Boys Camp spitting them out on the beach to run back to the sandy shore of Girls Camp. The Second group is what we liked to call the ‘sloggers’ or the slog joggers. This route took the campers through Boys and Girls camp, but cut it just a little bit slower. Finally we had our walking group that took a leisurely walk through Girls Camp, down the road to no where and over a dune to the beach where they finished their walk on sandy Lake Michigan. After the campers all completed their variations of the Doc Wheels Fun Run, we all congregated on the Green Acre where we had donuts, fruit and string cheese for breakfast! But the excitement was far from over…Campers grabbed their ‘welcome back’ signs and changed into their t-shirts they made especially for ride in because it was just about time. We lined the Green Acre as Odyssey rode their bikes down to meet the Voyagers in the water. All that could be heard was the cheers from loved ones screaming “we are proud of you” over and over and over again. As Odyssey and Voyager former a circle in the beautiful Lake Michigan, campers, leaders, and family lined the shore and watched as these incredible individuals sang their well deserved Founder Hearts. 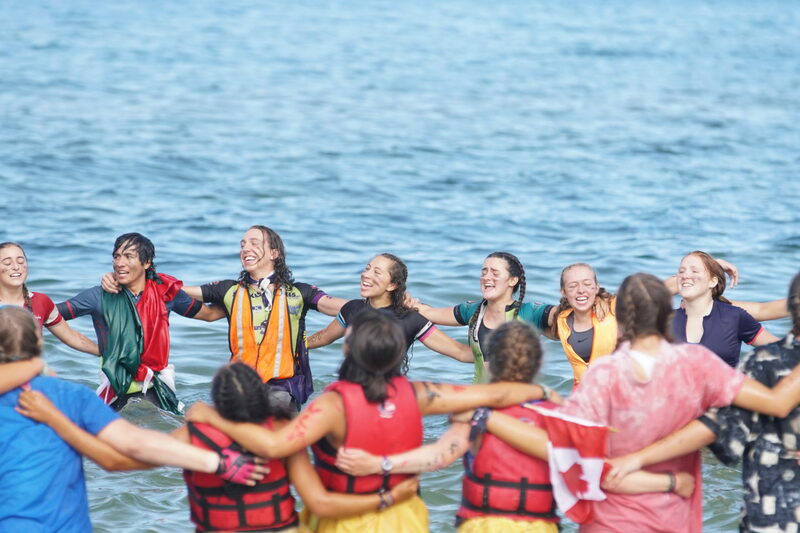 After they finished, campers were reunited with past leaders, siblings, and everyone in between. Tears of happiness, accomplishment, and proudness were flowing freely. We are so incredibly proud of what these campers just accomplished.